Good morning friends, and welcome to my first Christmas post of the season! I know it’s a little early for some (ie; my husband, haha! 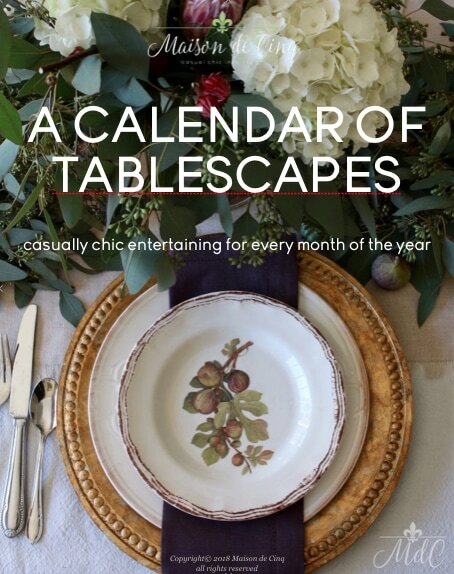 ), but as bloggers we love to decorate early and, hopefully, inspire others. So on that note, today I’m joining the most amazing group of bloggers for Ella Claire’s Seasons of Home Holiday Series. This group is so talented and full of style – I just know you’ll find all kinds of inspiration from them! 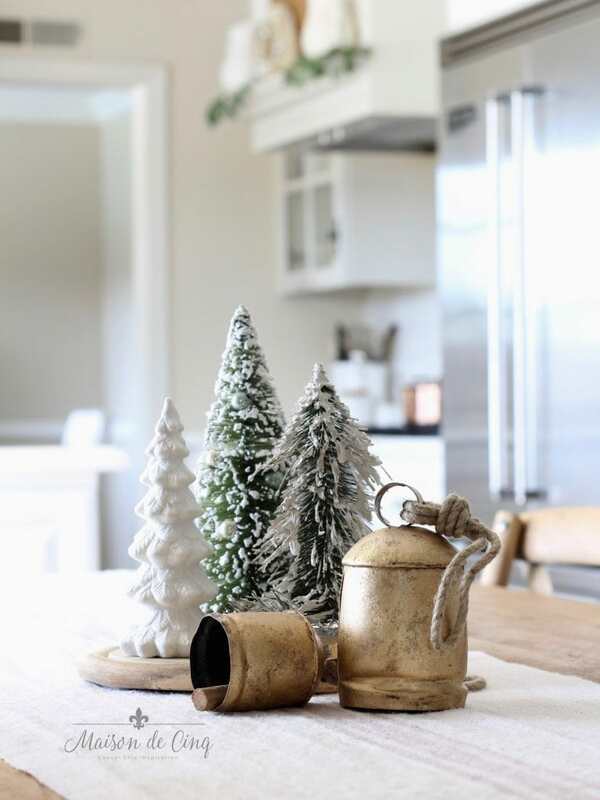 This year I’m taking a little bit of a departure from last year’s Christmas color scheme – not too much – just slightly 😉 I’m still doing my take on French country style, but rather than just having whites and greens like last year, I’m adding some touches of soft pinks, blush, and copper. And I’m loving the result! So welcome, I’m so glad you’re here! 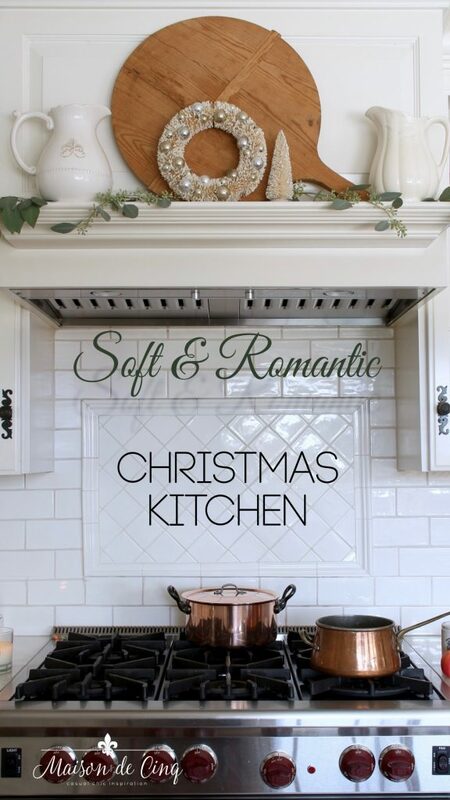 Come on into my Soft & Romantic Christmas Kitchen Tour…. If you’re a regular reader or were here for last year’s Christmas tours, you know I love my little bottle brush trees. I’m finding them harder to find lately, so I’m glad I added a few to my collection last year. I just find them so charming! I’ve decorated the kitchen mantel pretty simply, as always. 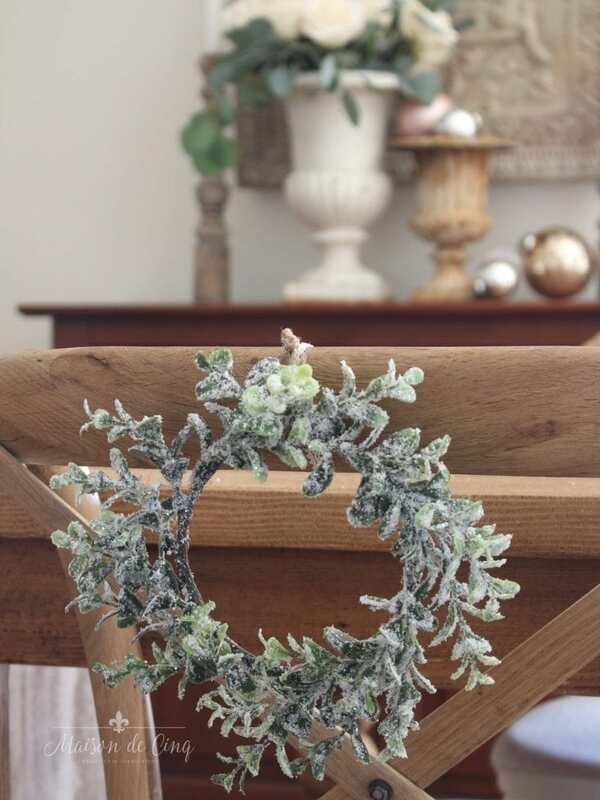 A little white wreath, a bottle brush tree, and a few sprigs of seeded eucalyptus create a sweet vignette. And of course, copper on the stove is a must for me these days! 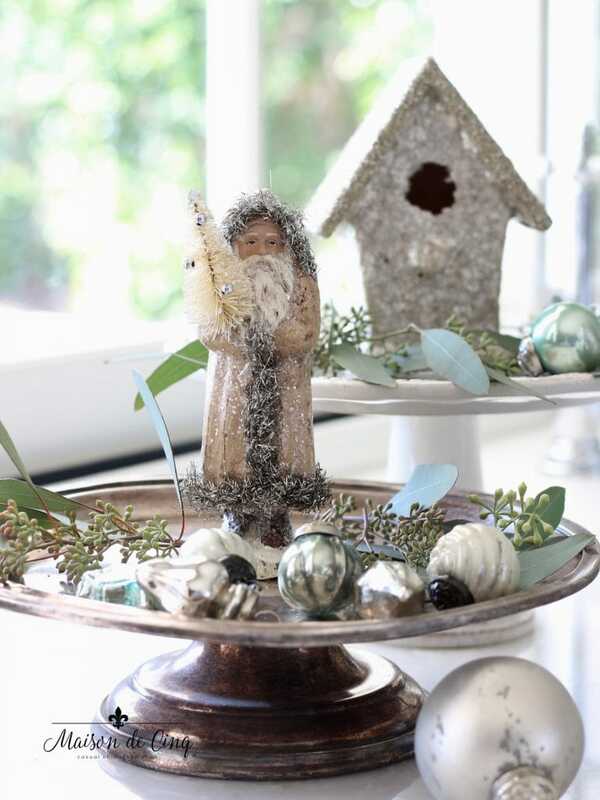 In the corner of my kitchen counter where I always like to have a seasonal vignette, I’ve grouped a few ornaments with another bottle brush tree and a couple of my vintage Santas. Here is a little of the blush pink I spoke about earlier. 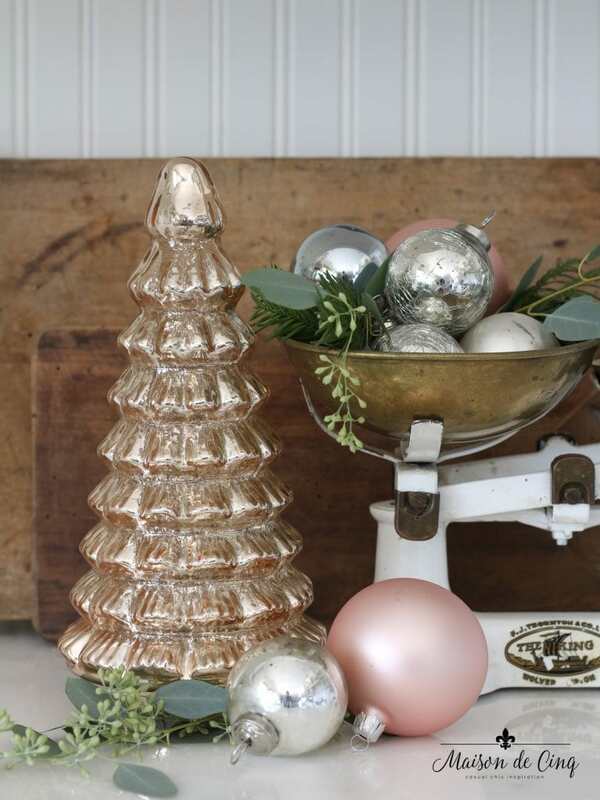 A mercury tree in blush along with a few pink ornaments makes a sweet statement on the counter. And a little tree made his appearance in the kitchen! I’ve never had one in here before and I love the cheer it brings. 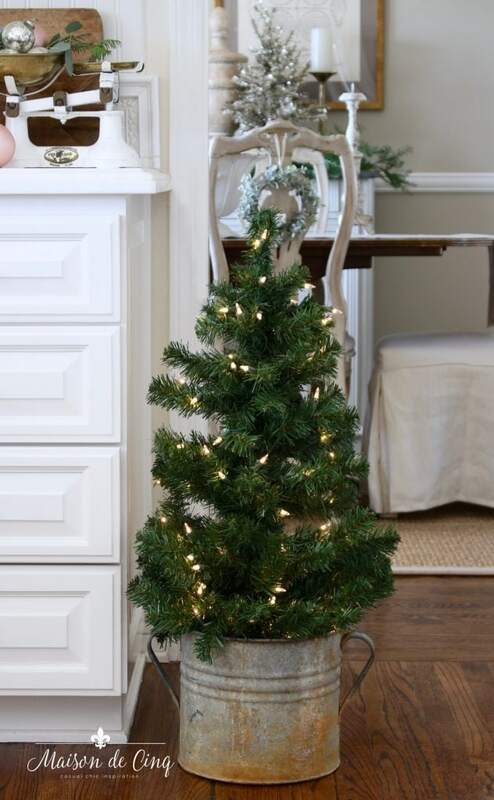 And I decided to leave it bare – just a simple green tree in a vintage zinc bucket. 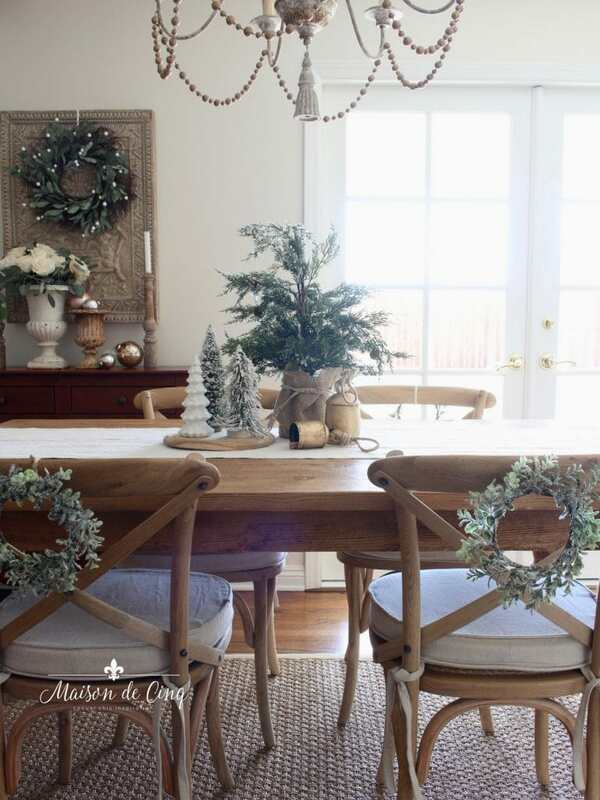 I’ve often seen little wreaths on the backs of dining chairs but I’d never done it myself until this year. Such a charming little addition! 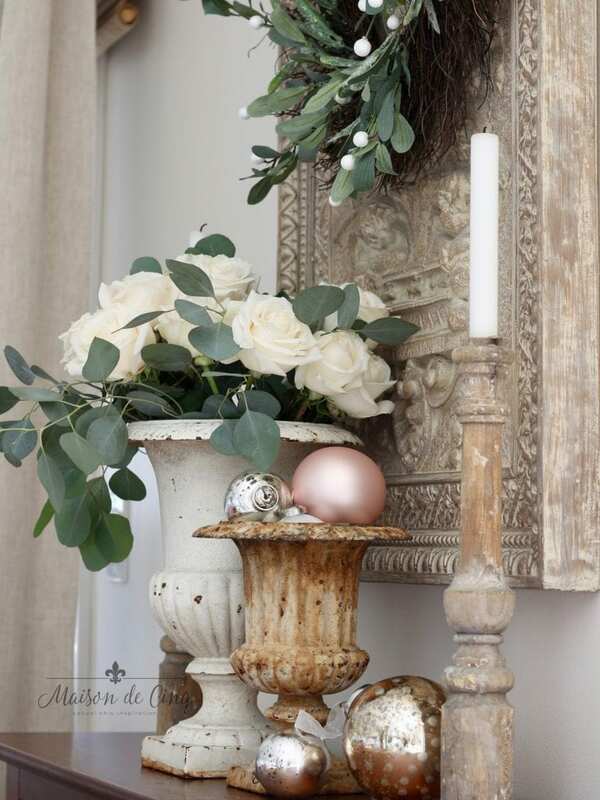 Here on the console table, I’ve grouped some vintage urns holding roses and more of the blush pink ornaments. This wreath is a new one, and I adore it! 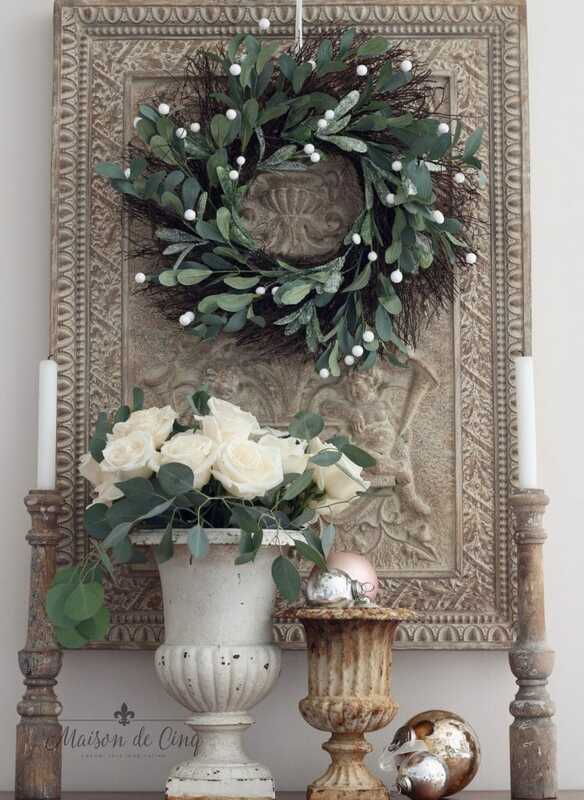 I always love twig wreaths, and this one with it’s faux mistletoe is exactly the color palette I’m going for this year. This is the first of many holiday posts that will be coming your way over the next six weeks or so. 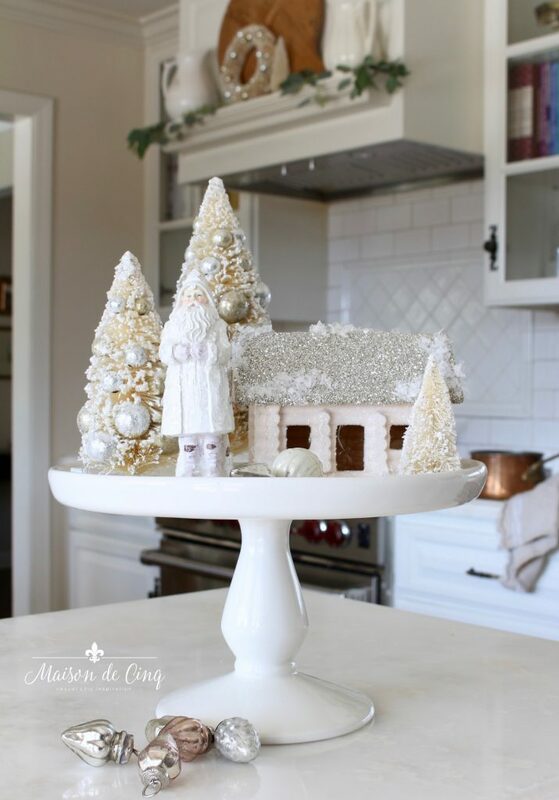 Next week is my first Christmas tablescape, and another sneak peek tour. But don’t worry – I’ll be doling them out slowly so I don’t overwhelm you since I know most of you probably won’t be decorating for awhile yet! 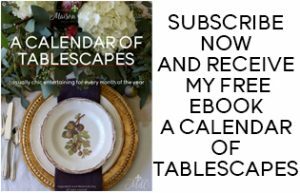 I hope you’ll get some ideas and inspiration from them – you can pin what you like now, to come back to later when you actually start decorating! Don’t forget to scroll to the end to see all the other talented bloggers who are sharing today! Just love all of your beautiful decor. So peaceful and lovely. Do you mind my asking where you found the urns on your mantel? Thanks so much Bonnie! 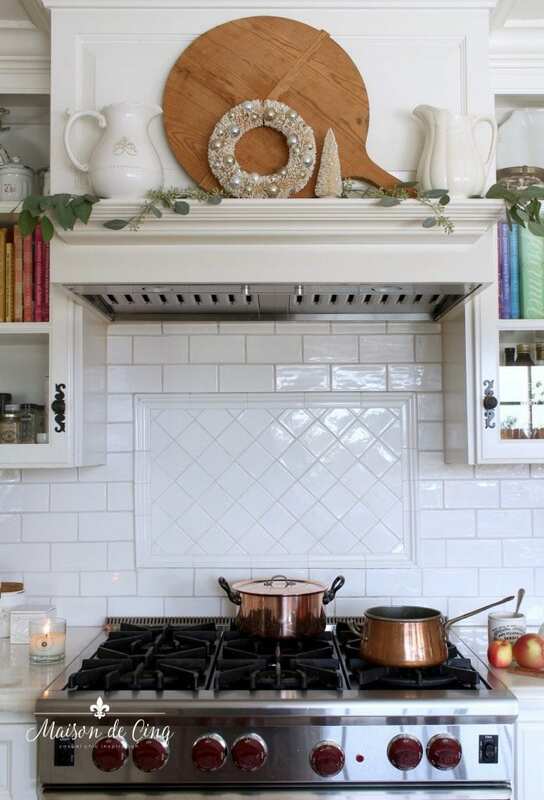 I’m assuming you mean the white pitchers on my stove mantel? If so, they are from Home Goods and/or Etsy, and I have linked similar ones in the post. Hope that helps! So pretty! 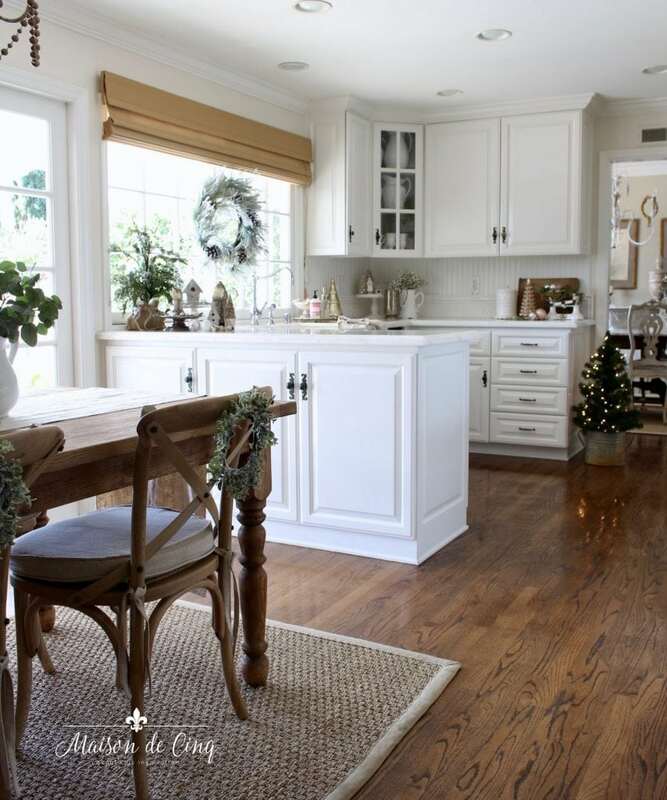 What is your wall paint color in your kitchen? Thanks! Thanks so much! The walls are Muslin, by Benjamin Moore. Hope that helps! And thank you for stopping by! Your decor is just stunning! I like this post so much. Love your decor! So pretty. I have a shelf like yours above my kitchen stove and am afraid if I put my large cutting board on it, the board will fall forward. Do you use something to anchor the cutting board to the shelf? Thanks so much Barbara! And yes, I do have the cutting board on a small wad of Quake Hold (It’s also leaning backwards slightly which helps, too, I think). Quake Hold is kind of like silly putty and holds things securely on shelves. (I’m in California so I have this everywhere!) Hope that helps! 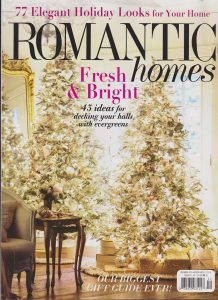 Loved your feature in Romantic Homes. Congrats Sheila! Aww thanks so much Shirley – that’s so kind and I really appreciate it!! Thank you – I’m so glad you like it! 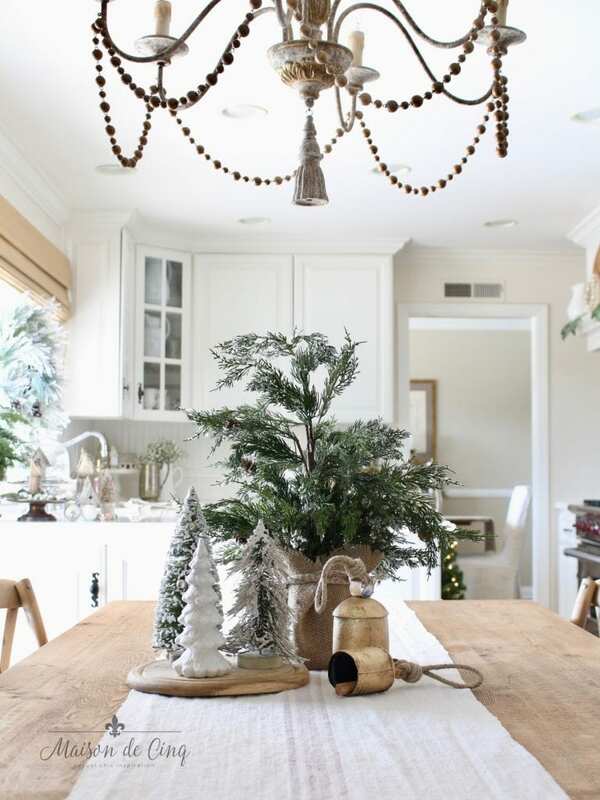 I love the soft colors and the cute tree in the zinc bucket. Beautiful job, my friend. Definitely inspiring! Aww thanks so much Shelley! Now to get all the other rooms done!